Place flour and salt in a food processor fitted with a steel blade. Pulse a few times to combine. Add butter and pulse 12-15 times, or until the butter is the size of peas. With the motor running, add the ice water all at once through the feed tube. Keep hitting the pulse button until dough starts to come together. Turn dough onto a well floured board and form into a ball. Wrap in plastic wrap and refrigerate for 30 minutes. Divide dough into 6 pieces and roll each on a floured surface into 9-inch circles. Boil potatoes to cook, and cool. 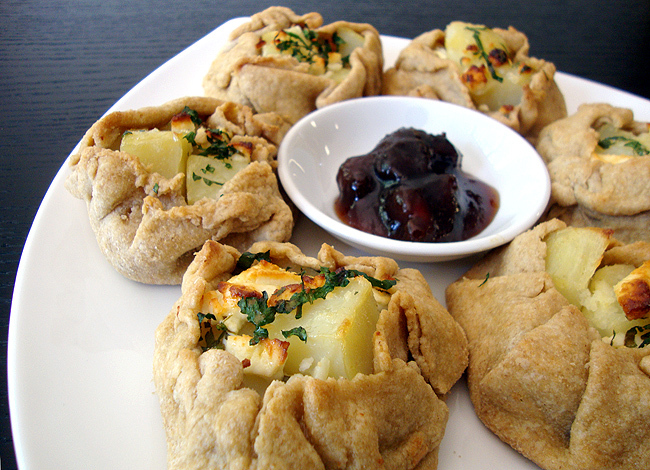 Place tablespoonfuls of diced potatoes and feta in the middle of the pastry circles, sprinkle with garlic and parsley. Add salt and pepper to taste. Fold up the edges of pastry, leaving center uncovered. Brush folded pastry with milk or melted butter. Bake for 20 minutes or until golden brown. Serve warm with a spicy fruit chutney and salad greens. It's simple to make but really tasty. Thank you! YUM! Love this! <3 and Hugs!